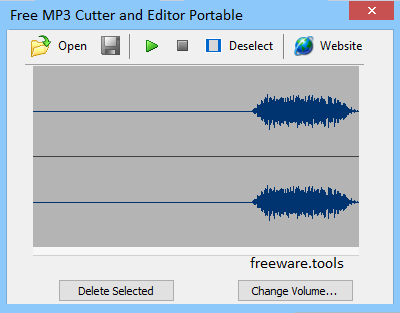 Free MP3 Cutter and Editor is a simple audio editor which, despite its name, works with both MP3 and WAV files.The program is a little short on features, but then it's not targeted at power users, rather it's all about concentrating on the basics: trimming unwanted audio, tweaking volume, or converting your chosen audio to mono or stereo. That aside, though, Free MP3 Cutter and Editor works much like any other audio editor, so you'll feel home right away. After opening a file, you'll see the waveform of that particular song. You can select a particular region of the tune in a mouse click or two, then perhaps delete it with a click. When working with audio files, users might often time require a way of editing the audio tracks to the preferred specifications. Adjusting MP3 or WAV files to other lengths can be done using several software packages, some of which might be too complex for the needs of the average user. Free MP3 Cutter and Editor Portable will provide a straightforward tool for cutting audio tracks to the required length or adding effects such such as fade-in / fade-out. This portable version of Free MP3 Cutter and Editor from the same developer presents users with a basic interface that will only provide the essential tools for editing the inputted audio files. One will be able to easily input the preferred audio tracks and the application does support drag-and-dropping. The signal waveform for each of the inputted file can be previewed in the main visualizer area and the on-screen sliders help users set the duration limits with ease. Using either the on-screen sliders or the dedicated buttons, one will be able to easily set the preferred duration for the audio tracks. Other adjustments are available and people will be able, for instance, to increase the volume or add fade-in / fade-out effects selectively, only for the selected duration. Providing support for both MP3 and WAV files, Free MP3 Cutter and Editor Portable will also enable users to convert their tracks to and from mono / stereo. All in all, Free MP3 Cutter and Editor Portable proves to be a good companion for those who require a quick and efficient tool for adjusting the length of their audio tracks. It will allow them to input files with ease, in both MP3 or WAV formats and select the preferred duration. Extra features such as volume amplification or mono / stereo conversion complete the bundle, but demanding users might not be satisfied with the basic tools provided.